Real Auto Tips. - There are many ways to avoid your tired and bored when we take long trips using cars. Specially when we get jamming on the way, we need something to avoid us from the boring. One car tools that will make you avoid your boring is Audio Video Car TV Head Rest Clip On. 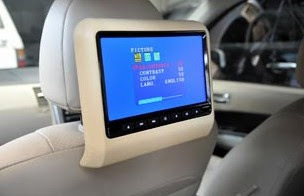 According otomotifnet site reported that there are many kinds and models of monitors that offer audio outlets, such as roof mounted models, head rest, and sunvisor. This time there are new and offered with a clip on the model, which is only two iron bars mounted on the original car head rest. We must not change the existing headrests. Screens also wider which is 9 inches. It is also equipped with a DVD player, games, flasdisk. Ease back the installation can be connected to the existing head unit, or can be plugged into the cigarette lighter for power. Can also be removed for use at home. Remove the head rest / seat headrests, and put monitors clip holes on two iron buffer. Once installed in the seat, can be connected to the head unit. If the head unit is double dint just connected existing wires. If not equipped head unit, for electricity on the TV monitor is pretty plugged into the cigarette lighter. Installations have been installed all, you can try this product benefits offered include a DVD player, CD game, USB connector and memory card. After Audio Video Car TV Head Rest Clip On has been installing in our car, and now we can enjoy our Audio Video Car TV Head Rest Clip On to keep our trip from the boring.